Get Your FREE Plan — Your Challenge Starts Now! A goal without a plan is just a dream — and we&apos;re here to make your dream physique a reality! We&apos;ll give you a free personal training program designed by top fitness experts to help you achieve your fitness goal. All you need is dedication and we&apos;ll provide everything else you need! MusclePharm Athletes Help You Reach Your Goals! Our Top Two Training Programs! Train like Kris for the best workouts of your life! Eat and supplement like Kris to build muscle and get ripped! Exclusive tips and tools to start off day one strong! Our most popular plan - more than 5 million views! 3-phase body-sculpting, fat-burning workout routine. 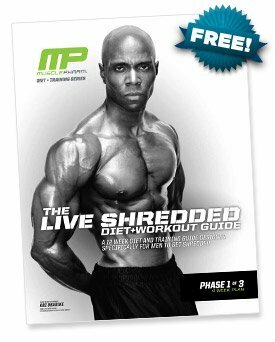 Includes recipes, shopping list, motivational tips and more!